The fourth playtest draft of Microlite75 is now available. Changes for this draft are again mostly in the optional rules section. Major additions include: more advantages and disadvantages, the Techno class (and “weird science” rules to support it), the Adventurer class (for single class games), fame, sanity, psionic combat, spirits and spirit binding, combat tricks/stunts, and an equipment list. I spent a lot of time rearranging the spell list into alphabetical order only to discover that by the time I added tables listing spells by level for each type of magic the result was much longer than spells-by-level listing I’ve been using — even with reduntant spells removed. Unfortunately, this wasted about a week’s worth of spare time work. My ideas for revised combat maneuver rules flopped in play, so they aren’t included in this version. I did not get quite as much done for this version as I had hoped thanks to the time I wasted with the spell reorganization. The Firecracker Cancer Fund Drive is on (through July 12th). 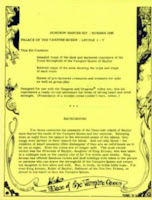 Every $10 donated gives you one chance to win a copy of Wee Warriors Palace of the Vampire Queen (the first D&D module published — in 1976). Highest donors will also divide a huge list of other RPG items from the 1970s and early 1980s (including more rare publications). You can see the complete list of 10 items and read more about this fund drive in this post: OD&D Wee Warriors Goodies Available (For Cancer Fund Donors). This is in addition to the usual PDF downloads and other benefits of a donation to the RetrpoRoleplaying Cancer Fund. To get help us pay our cancer treatment related bills (and to get access to some special downloads and possibly the above mentioned Firecracker items), send a donation in any amount — small or large — to me via Paypal. Thank you!